SARASOTA, FL--(Marketwired - Oct 20, 2015) - After a multi-million dollar investment, The Ritz-Carlton, Sarasota debuted a re-imagined hotel. The re-imagination reveals a fresh lobby look, complete renovation of all 266 guestrooms, new Club Level and Lounge and full updates of the ballroom and meeting spaces. Led by Jude Mulhern of Bilkey Llinas Design, based in West Palm Beach, Fl., inspiration was drawn from the Gulf seascape and history of the destination to create a uniquely Sarasota experience at the luxury resort, playing on the hotel's scenography of "Water, Rings and The Arts." The new color palate in the guestrooms evokes flora and fauna from the nearby Selby Botanical Gardens, alongside soft blues and purples reflected in Sarasota sunsets. Each room is appointed with an eclectic mix of contemporary and traditional furniture that speaks to the history of the destination as the winter home of American circus owner John Ringling; his Mediterranean Revival residence and former home, Ca' d'Zan; and the Ringling Museum. Artwork displayed in the Sarasota hotel rooms is a selection of images from local artists and students of the prestigious Ringling School of the Arts. The carpet features a non-repeating, abstract motif of a Nautilus shell, a first of its kind in hotel design, thanks to new technology. Guestroom corridors and elevator lobbies now feature an oversized contemporary moiré wall covering reminiscent of sand dunes and sea, offset by soft textured corridor carpet, which is an interpretation of a Sarasota sunset with blue water kisses dancing on a sea green and lavender textured ground. The Club Level and Lounge experience that is distinctly Ritz-Carlton has been reimagined to reflect the new ambiance at the downtown Sarasota hotel. Continuing with the seashore theme used in the guestrooms, the Club is an inviting space for guests, evoking the feeling of a shore-side picnic under a banyan tree. Locally-captured photographs of seagulls and shore life, alongside colorful artwork and décor reflecting the beautiful Selby Botanical Gardens transforms the Club into an extension of the outdoors in Sarasota. Inspiration for re-imagination of the 12,000-square-foot ballroom and five distinct meetings spaces started from a mosaic on the grounds of the Ca' d'Zan. This is particularly reflected in the carpet design: a background of star constellations reflecting in an abstract pattern that feels like the night sky, harkening to days when Sarasota sailors navigated their route home by reading the star patterns. The crystal ballroom chandeliers are interpretations of circus rings, illuminating over the mosaic motifs to become artwork elements in the carpet. The décor in the event venues serves as a linking element between whimsical resort themes and the sailor-inspired design of the Jack Dusty restaurant. "The reimagined property encapsulates the soul of Sarasota, tying in local history, art and culture, which is prevalent in all areas of hotel," said General Manager Damien O'Riorden. "The seashore theme is widespread throughout the hotel from the décor of each guestroom to the property being home to the only seaside restaurant in Sarasota, Jack Dusty." Guests can experience the re-imagined Ritz-Carlton, Sarasota with rates starting at $419 per night, plus taxes. For additional information please contact (941) 309-2000 or visit www.ritzcarlton.com/Sarasota. A luxury landmark on Florida's central Gulf coast, The Ritz-Carlton, Sarasota is conveniently located near the city center overlooking Sarasota Bay, just minutes from premier arts venues, nature sanctuaries, distinctive shopping, fishing and watersports. Named one of the Top Golf Resorts in the World by Condé Nast Traveler, this destination resort is also home to The Ritz-Carlton Spa, Sarasota, named the #3 Spa in the U.S. and Canada by the readers of Travel + Leisure magazine. In addition to a Gulf-front Beach Club, Tom Fazio-designed Golf Club, Spa and Wellness Center, children's recreation programs and 266 guest rooms with Ritz-Carlton Club Level accommodations, The Ritz-Carlton, Sarasota offers 218 Residences and a private country club-style Membership. The Ritz-Carlton Hotel Company, L.L.C., of Chevy Chase, Md., currently operates 90 hotels in the Americas, Europe, Asia, the Middle East, Africa, and the Caribbean. More than 30 hotel and residential projects are under development around the globe. For more information or reservations, visit the company web site at www.ritzcarlton.com, and for the latest company updates, visit news.ritzcarlton.com. The Ritz-Carlton Hotel Company, L.L.C. is a wholly-owned subsidiary of Marriott International, Inc. (NASDAQ: MAR). 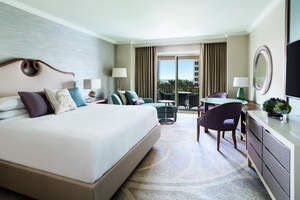 After a multi-million dollar renovation, The Ritz-Carlton, Sarasota, now has a fresh lobby look, a complete renovation of all 266 guestrooms, a new Club Level and Lounge, and updated ballroom and meeting space.